Product code: GUNRH15T Categories: Herbs/जडी-बुटी, Seeds/बीज. Buy Laal Gunja/लाल गुंजा (21 Pcs.) best quality for Puja, Yajna other spiritual and religious activities. Duly cleaned and sainted by expert priests. Laal Gunja, Red Gunja Herb/लाल गुंजा: Laal Gunja Herb symbolizes Goddess Lakshmi and it is said that the wearer is blessed with wealth and prosperity. 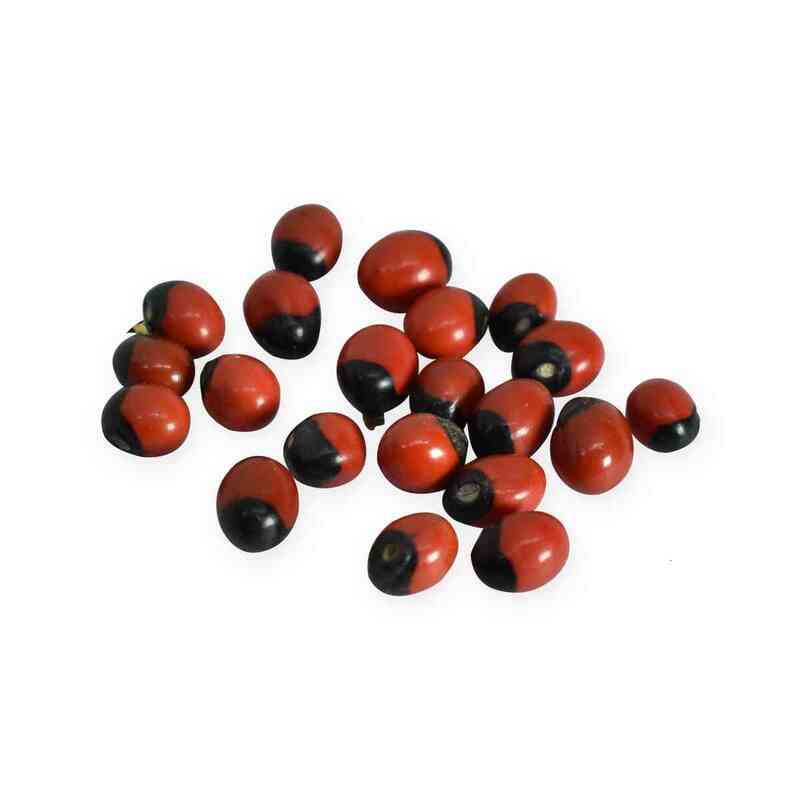 These seeds are used to ward off evil and removal of black magic effects. They bring luck and ward off evil and Black Magic, & protect the wearer from physical harm by taking the abuse upon themselves. In India, the extract of the root of the plant is used for application to relieve eye diseases. The plant is also used in Ayurveda and is said to promote hair growth. It is sometimes used as an ingredient in Indian hair products. The Laal Gunja are considered poisonous in Ayurveda and a specific method has been written to purify them. The purified Abrus is a nerve stimulant and is used in vata disorders like joint pains and paralysis. The paste of seeds is applied locally in alopecia and skin diseases. It has also been mentioned as a contraceptive in Ayurveda. The Laal Gunja plant is best known for its seeds, which are used as beads and in percussion instruments, and which are toxic because of the presence of abrin. Ingestion of a single seed, well chewed, can be fatal to both adults and children. The Laal Gunja plant is native to India and grows in tropical and subtropical areas of the world where it has been introduced. It has a tendency to become weedy and invasive where it has been introduced. Red Gunja Herb or Jequirity seeds are poisonous. Jequirity beans poisoning has cholera like symptoms. Therefore, in Ayurveda they are subjected to purification process (Shodhan) prior to use. Seeds are used internally in affections of the nervous system and externally in skin diseases, ulcers, affections of the hair etc. The seeds are not administered as a single drug but used only in combination. Laal Gunja Herb Weight: 21 Pcs. Laal Gunja Delivery: 2-3 days. Buy Mota Namak/मोटा नमक (200 Gram) best quality for Puja, Yajna other spiritual and religious activities. Duly cleaned and sainted by expert priests. Buy Bakuchi Herbs/बाकुची (200 Gram) is an ayurvedic herb, very well known for its efficacy against skin diseases including Leucoderma. Its botanical name is Psoralia corylifolia. It belongs to Fabaceae family. 100% Mongra Organic Saffron Kashmir with long and thick stigmas having almost 0% flower waste. 1 GRAM PACK WITH HOLOGRAM STICKER..
Buy Turmeric/Haldi(हल्दी) (200 Gram) best quality for Puja, Yajna other spiritual and religious activities. Duly cleaned and sainted by expert priests. Buy Star Anise/चक्र फूल (200 Gram) is used mainly as a spice but it is also known to have numerous important health benefits. It is a star shaped fruit belonging to a plant native to China called illicium verum. Buy Vidhara Herb/विधारा (200 Gram) best quality for Puja, Yajna other spiritual and religious activities. Duly cleaned and sainted by expert priests.